All Top Comics #1 (undated, but copyrighted in 1945) after all of those were well established as cover-featured comic book characters. Like many superheroes (e.g., Doctor Solar or Captain Flash), Cosmo was powered up by something that would kill most people — in this case, accidentally dropping (and thereby setting off) a bomb at the atomic plant where he worked. 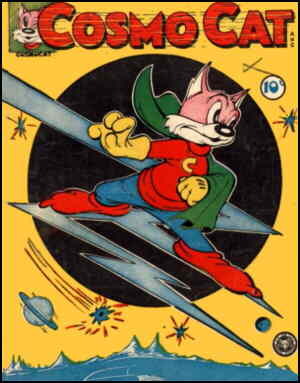 But like Atomic Mouse, Super Goof and any number of other funny animal superheroes (as well as a few human ones such as Hourman), he maintained his powers (the generic ones, strength, invulnerability and flight) by ingesting the sort of stuff we now think of as a drug, his substance of choice being Cosmic Catnip Capsules. He lived in a laboratory on the Moon, and used a "telefinder " to spot evil on Earth. When he found some, he'd use his "cat-rocket", which was powered by "blaster beams", to get there in a hurry and vanquish it. Cosmo had a sometimes-sidekick named Dunky Duck, who didn't have super powers but used a jet belt to get around. Fox had a separate funny animal adventure hero, Flash Rabbit (a funny animal version of Flash Gordon), who also debuted in All Top #1 but never was feaured on the cover. All Top lasted seven issues as a funny animal title. With the 8th (November, 1947) it switched to jungle adventure, and the new star was Rulah the Jungle Goddess (a rip-off of Fiction House's Sheena, Queen of the Jungle). Cosmo continued in his own title, which started in August, 1946, as well as in Wotalife Comics, where he'd been the star since its September, 1946 third issue. Also in 1946, he was featured on at least one cover (the enigmatically-named Zoot Comics #2) without appearing inside. Wotalife lasted until #12 (July, 1947), after which its title was changed to that of its new star, Phantom Lady. In his own comic, Cosmo ran ten issues, the final one dated October of the same year. As far as new, non-reprinted, stories go, he wasn't seen again. During the 1950s, Fox's properties were scattered among several small publishers. Cosmo Cat was reprinted by Green Publishing Company in 1957, by Norlen Magazines in 1959, and by IW Enterprises circa 1960. Nowadays, he's scarcely even remembered. Text ©2005-10 Donald D. Markstein. Art © Fox Feature Syndicate.